President Barack Obama made a historic visit to Russia in an attempt to improve Foreign relations. The First Lady Michelle Obama was greeted during her trip to Moscow. Obama visits Russia to improve historic relations. Soul mates? No. But President Obama and Russian Prime Minister Vladimir Putin could be called frenemies after their first high-stakes meeting outside Moscow Tuesday. The two leaders shared breakfast at Putin's dacha, where they praised each other - but also acknowledged deep divisions. A key flash point is their differing view of neighboring Georgia. The Kremlin backs separatists there and crushed the country's tiny army during battles a year ago, while the U.S. supports its admission to the NATO alliance. "I don't anticipate a meeting of the minds anytime soon" on Georgia, Obama told Fox News. Putin noted the two nations have been at loggerheads over "events of different, shall we say, color" - a reference many experts saw aimed at the U.S.-backed pro-democracy "color revolutions" in the former Soviet states of Georgia and Ukraine. Putin, extremely popular and widely regarded as the true ruler of Russia, consolidated his power dramatically while opposing those revolutions, branding them Western power grabs and attempts at regime change. Obama still delivered a pro-democracy message after his meeting, though, leveling careful criticism at Russia's autocratic tendencies and widespread corruption. Senator Barack Obama and Senator John McCain showed their sense of humor at a political Alfred E. Smith dinner. Each presidential candidate took turns roasting themselves and each other to show a lighter side of a negative campaign. John McCain appeared on David Letterman last night and was forced to admit his association with convicted Watergate burglary mastermind G. Gordon Liddy. The humorous riffs at the annual Alfred E. Smith dinner in Manhattan belied the increasingly nasty campaign that has emerged in recent days but gave the candidates, who sat on either side of Cardinal Edward Egan, a chance to get a few things off their chests and maybe score some political points, decked out in tuxedos. 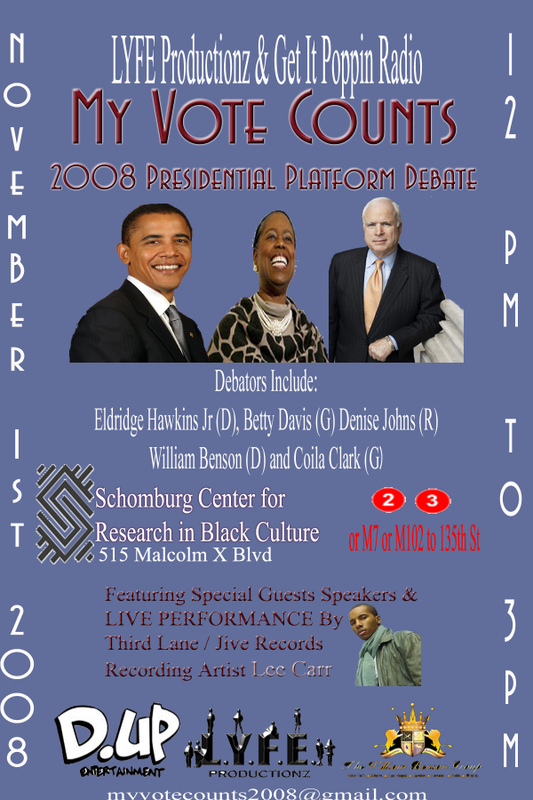 McCain, recalling the second debate, described Obama as "a man known to Oprah Winfrey as The One. "Being a friend and colleague of Barack, I just called him 'that one.' Friends, he doesn't mind at all; in fact, he even has a pet name for me: George Bush," McCain said. McCain, in his 15-minute comedic routine, also poked fun at ACORN, Bill Clinton's sometimes seemingly lukewarm support for Obama, and his favorite target, the press. For his part, Obama poked fun at himself, likening himself to Superman and a fancy celebrity. "I was originally told that we would able to move this outdoors to Yankee Stadium," he said. "Can someone tell me what happened to the Greek columns I requested?" He also joked about McCain's age, saying he must have had fun in the good old days before Prohibition, and said that the housing crisis "has been eight times harder on John McCain." This voting PSA stars celebs urging everyone to vote. The video starts off with celebrities like Leonardo Di Caprio, Halle Berry and Jamie Foxx saying the words,"don't vote." Superbad's Jonah Hill is funny in the spot and adds some lighthearted punchlines. The tone changes and then each star begins to stress the importance of registering to vote to have your voices heard. Watch the clip to see cameos from Jennifer Aniston, will.i.am, Tobey Maguire, Natalie Portman, Eva Longoria, Usher, Demi Moore, Dustin Hoffman, Forest Whitaker and Ashton Kutcher. New York Governor Eliot Spitzer (D-NY), (super delegate pledged to Senator Clinton) resigned last week due to his involvement in the Emperor's Club V.I.P. prostitution ring. 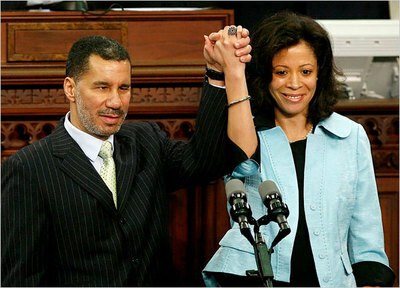 Lieutenant Governor David A. Paterson (D-NY) was officially sworn in on March 17th as New York State's 55th Governor. Mr. Paterson was sworn in as the state’s 55th governor almost exactly a week after revelations emerged that his predecessor, Gov. Eliot Spitzer, had patronized a prostitute and faced federal investigation. In a relatively brief speech lasting about half an hour, Mr. Paterson offered soothing rhetoric to an audience that clearly ached to move beyond what has been an unusually sordid ordeal even for Albany, a capital well-acquainted with political scandal. Speaking to a joint session of the state Assembly and Senate, with senior officials from at least three states in attendance, Mr. Paterson alluded briefly to the Mr. Spitzer’s difficulties over the past year in working with the Democratic-controlled Assembly and Republican-controlled state Senate. David A. Paterson, 53, who is a super delegate pledged to Sen. Hillary Clinton, is making history on quite a few levels. New York's next governor will become the state's first African-American governor and the first legally blind governor in U.S. history as well as the 3rd African-American to become a governor in the U.S.
Lawrence Douglas Wilder (D-VA), (Governor of Virginia 1990-1994) was the first African-American to be elected as governor of a U.S. state. Wilder is currently Mayor of Richmond, VA since 2005. Deval Laurdine Patrick (D-MA) was elected governor of Massachusetts and took office on January 4, 2007 and is currently the only African-American governor in the United States. Lieutenant Governor David A. Paterson, who is legally blind, was born May 20, 1954 to Portia and Basil Paterson. He is married to Michelle Paige Paterson and lives in Harlem, New York with their two children, Ashley and Alex. His father, Basil Paterson, was the first African-American secretary of state of New York and the first African-American vice-chair of the national Democratic Party. Basil Paterson was the first African-American NYC Deputy Mayor and the first to run for statewide office in New York. Secretary Paterson was the Democratic nominee for Lieutenant Governor in 1970. The elder Paterson also served in the New York State Senate in the same seat his son David, later occupied and was also the first African-American vice chair of the national Democratic Party. To find out more about David A. Patterson, click here. 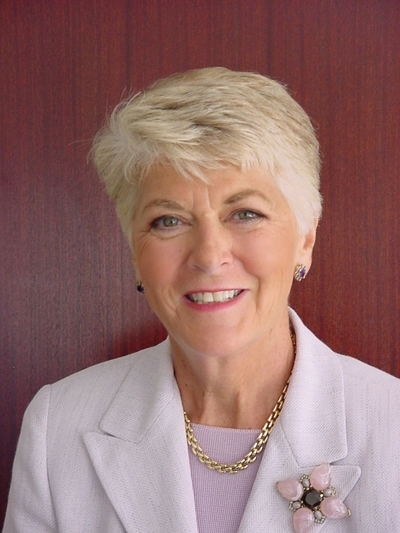 Geraldine Ferraro said the following statement about Barack Obama's presidential candidacy. "If Obama was a white man, he would not be in this position. And if he was a woman (of any color), he would not be in this position. He happens to be very lucky to be who he is. And the country is caught up in the concept." Keith Olbermann slammed Senator Hillary Clinton (D-NY) in a 10 minute long "Special Comment" monologue on Wednesday (March 12) saying that while he wasn't endorsing Senator Barack Obama (D-IL) for the democratic nomination for the presidency, "events insist" that he speak out about her "tepid response" to the remarks recently made by Geraldine Ferraro. Former Vice Presidential candidate Geraldine Ferraro quit her position on Hillary Clinton's finance committee but did not apologize for her comments about Barack Obama. CNN obtained her letter to Presidential candidate Senator Hillary Clinton. Olbermann put Sen. Clinton on full-blast for not taking control of the racial overtones of her campaign and accused her of "campaigning as if Barack Obama were the Democrat and you were the Republican." Barack Obama and Hillary Clinton camps are bumping heads once again over controversial comments that some have called "racist". The New York Times is reporting that Geraldine Ferraro has quit her position on Hillary Clinton's finance committee. "My comments have been taken so out of context and been spun by the Obama campaign as racist," she said on ABC's "This Morning America." "That, you know is doing precisely what they don't want done -- it's going to [divide] the Democratic Party and dividing us even more." Geraldine Ferraro appeared on Fox and sent a message to Barack Obama Threatening him by saying "Don't Antagonize Me"
"Every time that campaign is upset about something, they call it racist," she said. "I will not be discriminated against because I'm white. If they think they're going to shut up Geraldine Ferraro with that kind of stuff, they don't know me." Both Senator Barack Obama and Geraldine Ferarro made the rounds on the morning news shows Wednesday, a day after Obama's Mississippi primary win. IN THE OBAMA CAMP: Sen. Barack Obama called the comment "patently absurd." "I don't' think Geraldine Ferraro's comments have any place in our politics or in the Democratic party. They are divisive," he told the Allentown Morning News. "I think anybody who understands the history of this country knows they are patently absurd. And I would expect that the same way those comments don't have a place in my campaign, they shouldn't have a place in Senator Clinton's either," he added. "The bottom line is this, when you wink and nod at offensive statements, you're really sending a signal to your supporters that anything goes," Axelrod said in a conference call with reporters on Tuesday. "There's no other way to send a serious signal that you want to police the tone of this campaign," he added. "And if you don't do those things then you are simply adding to the growing compendium of evidence that you really are encouraging that." Axelrod said Senator Hillary Clinton has encountered problems because people view her as a "divisive and polarizing force." "The best way to address those concerns is to not allow divisiveness and negativity to flourish among your supporters," he said. "And this is an opportunity for her to address that." MEANWHILE: Obama's leading foreign policy adviser Susan Rice also called for Clinton to fire Geraldine Ferraro after her comments. Clinton said, "I do not agree with that," and later added, "It's regrettable that any of our supporters_on both sides, because we both have this experience_say things that kind of veer off into the personal." LAST WEEK: Samantha Power, who was a senior foreign policy adviser to Barack Obama resigned after she was quoted calling Hillary Clinton "a monster." The adviser, Samantha Power, was speaking to The Scotsman newspaper when she asked to make an "off the record" comment about Barack Obama's opponent Senator Hillary Clinton. Power called Clinton a "monster" who "is stooping to anything" to win the campaign. In a statement, Power apologized and said her comments were inexcusable. She had widely been seen as a pick for a senior position in an Obama White House. Senator Hillary Clinton's (D-NY) run for the White House gained steam Tuesday (March 4) as she won three primary races in Ohio, Texas, and Rhode Island -- ending Senator Barack Obama's (D-IL) string of 12 straight victories. Sen. Clinton won decisively in Ohio and Rhode Island and narrowly beat Sen. Barack Obama in the Texas Primary. 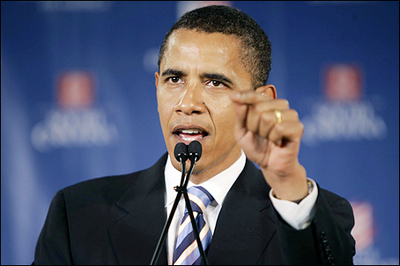 Senator Barack Obama won in Vermont and initial results show he was leading in the caucus held in Texas. In the Republican race, Senator John McCain (R-) won all four states and won enough delegates to secure the party's nomination. Senator Barack Obama won the South Carolina Democratic Primary beating Senator Hillary Clinton in the crucial win in the presidential race. ``After four great contests in every corner of this country, we have the most votes, the most delegates, and the most diverse coalition of Americans that we've seen in a long, long time,'' Obama told a cheering crowd of supporters in Columbia, South Carolina. Obama received an endorsement from Caroline Kennedy Schlossberg, the daughter of the late President John F. Kennedy, who said Barack Obama could "inspire Americans the way people tell me my father inspired them." Obama, who's vying to become the nation's first black president, got a boost from black voters who made up about half of those casting ballots today, according to exit polls cited by CNN. He overcame an initial swing toward Clinton among those voters, who in the past gave strong support to her husband, former President Bill Clinton.``Tonight was a rejection of the politics of the past, politics that divide us against each other,'' said Robert Gibbs, Obama's communications director. 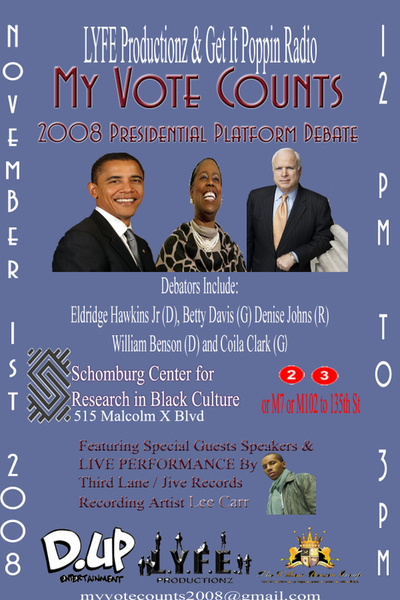 Gibbs said Obama's victory crossed racial, gender and income lines. Clinton released a statement saying she had called Obama to congratulate him. ``We now turn our attention to the millions of Americans who will make their voices heard'' in upcoming primaries, Clinton said in the statement. This CNN South Carolina Democartic Presidential Debate got pretty heated on January 21st between presidential candidates Hillary Clinton and Barack Obama.